In former times it was always customary for the church to set aside an area of the church land to be used as a cemetery for the deceased parishioners as their final resting place. The first cemetery for the Roman Catholic Germans in Fosters Meadow was located between the rectory of St. Boniface church (formerly the Church of the Nativity of our Lord)) and close to the Herman’s Hotel, on the west side of Fosters Meadow Road (Elmont Road) near Central Ave.(Linden Blvd). Years after the development of the second St. Boniface RC church and cemetery in 1868 on the east side of Elmont Rd., at Dutch Broadway, the remains were transferred to their final resting place. 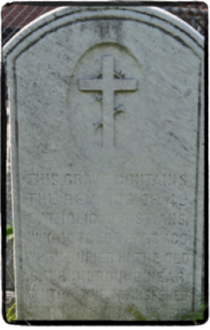 On May 16, 1916, the 49 Catholic Christians, were exhumed from the first cemetery and buried in the St. Boniface cemetery behind the second St. Boniface RC Church. 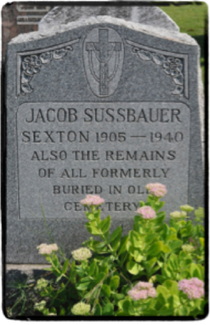 Their remains were buried in a common gravesite marked by one limestone tombstone directly behind the tombstone of Jacob Sussbauer, the church sexton. 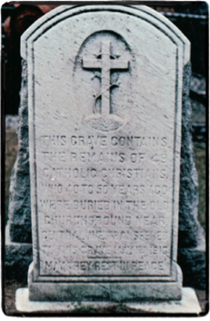 Today, the tombstone is barely legible, however thanks to a Fosters Meadow descendant, Barbara Rottkamp who took this photograph in the late 1980s, we can now read what was inscribed on the tombstone. The tombstones from the original cemetery were not moved or retained and their is no record of their names.